I know it’s not technically spring yet, but in Arizona, after Christmas I’m straight into spring mode. Conjuring up images of baby chicks and pastel chocolate eggs. Brightly colored flowers to lift my spirits and melt away any holiday frost. With each new year comes the anticipation of spring. New life adds a youthful glow, as hope abounds. So, I spent last night creating a new video for the Claire Burke website. It needed a holiday switchover and I was able to style some really beautiful floral shots for our spring catalog so I had plenty of inspiration. Home Fragrance Oil – what is it really? We’ve been making changes, haven’t you noticed? We’ve shed our old skin and had a makeover, we’ve added some new stunning fragrances and products, and we’ve even changed how we offer some of our products to you. Gone are the days of votives only offered in 4 packs. We now offer them individually. This makes decorating and even trialing a new fragrance more economical. AND…over the years you’ve known Claire Burke® for our amazing designer potpourri, our famous Home Fragrance Spray and even our Botanical Candles, you know the ones…that have the botanicals hand-placed ever so perfectly. But…do you know us for our Home Fragrance Oil? Well – we want you to! For all of you home fragrance fanatics out there, I promise that this is a must have product. We even redesigned the packaging; the bottle has a built-in dropper-type dispenser making it more user-friendly! Just tip it over and it will start to drip out. It’s even offered in all of the Claire Burke fragrances too! I think all of the bases are covered with this one little bottle of oil – talk about bang for your buck! OH, and….you’ll even be able to use our Home Fragrance Oil in the new accessory we are unveiling in February! Stay tuned to www.myclaireburke.com or the Claire Burke Facebook page for more information. Carrie brings a contemporary view to the tradition of fragrant decor with modern updates and a strong sense of style and grace. Working with the Claire Burke brand for almost 10 years, Carrie blends today’s home fragrance trends with the tradition of quality and beauty Claire Burke is known for. Claire Burke is an incredible place to start filling your home with beauty and fragrance. With scents that seem to waif through the air this time of year and beyond. Slice of Spice, O Christmas Tree, Tropical Flowers, Vanilla Bean, Wild Cotton and our new favorite, AppleJack and Peel. It’s the beauty of bringing scents that remind us memories and generate new beginnings. It’s simply Claire Burke. Claire Burke has outdone themselves in all areas. The Peel is an endangered candle at our house. It sits in our foyer, greeting guests. A couple of times my husband has gotten out the Bic, but my children come running begging him to save the candle. He’s tried to explain that if we light it the smell will infuse throughout our home, but they will have none of it. They love the beauty of the candle. They love picking it up and holding it and then inhaling as deep as possible to extract the delicious smell it holds. Candles are a part of our home. I love their beauty but after experiencing Claire Burke I realize there is more than a color scheme or scent. A candle can be a display of beauty. A conversation starter. Claire Burke is unique and truly adds new charm to our home. 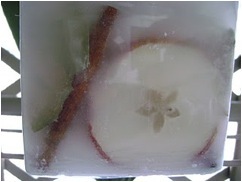 While we have not lit the Claire Burke AppleJack and Peel candle, I don’t think we are the exception. After all, their slogan is decorate with fragrance. This we are doing and I think it adds a bit of charm to our home, and even without a flame flickering in its center, it is a wonderful smell that warrants compliments from nearly everyone who enters our home. I’ve been chatting about “Decorating with Fragrance” lately. 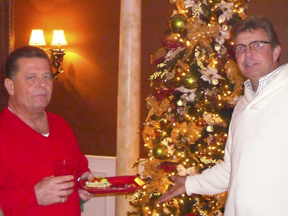 My husband and I had a Christmas Party this weekend for some very dear friends. A very good time was had by all and I received many compliments on the holiday decor throughout the house. One friend (no lie) thought one of my Christmas trees was real and could not believe it wasn’t! Here’s a picture, you be the judge. My husband, Ray, who loves real trees, sprayed Claire Burke “Oh Christmas Tree!” Room Spray around the room, it must have been convincing! Above are a couple of guests who may or may not have really thought it was real, but they did say it was ‘real’ pretty. Below, is the Claire Burke “Christmas Memories” diffuser which is such a beautiful fragrance! You can place this diffuser anywhere, as the scent is lovely yet subtle. No, I’m not being paid for this endorsement of the Claire Burke products, I just happen to enjoy quality scents in my home and I hope you will too! Stay tuned for an update on the #IntDesignerChat Design Challenge in Chicago that my team won, I want to share more details with you. Also, a lot has been happening on the Creative Arts Studio front and I can now release the name of it, as the owners have registered their trademark. It is called “Creation Nation” and you heard it here first! Have a wonderful, joyous holiday! It’s that time of year! You know, bustling about, shopping for gifts, preparing the house for Holiday gatherings. Well, I have discovered the most beautifully scented candle to set the tone! It’s called “Slice of Spice” by Claire Burke. It’s one of those rare fragrances that can transition from autumn into Christmas! Truly this fragrance is all my favorites wrapped into one! Pick up several, perfect gifts for school teachers, your hair dresser, neighborhood party, etc. Fragrance fanatics like myself look at candles as a part of daily life: they’re great first thing in the morning while I’m getting ready for work, great for setting the mood for a dinner with friends, and great to help me relax in a hot bathtub at the end of a long day. 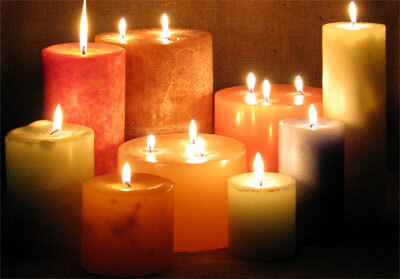 But for people who aren’t used to using candles everyday like me, they make a great gift of something new and special. 1. You can’t go wrong with a candle. Men and women alike enjoy candles, which make candles a reliable gift for that certain someone you never can figure out how to shop for. 3. If you can’t make it, fake it! Candles are great for that of yours who’ll spend hours in the kitchen, only to have the food smell like burned up cookies. Candles can give the home that fresh-baked smell, without the hassle. 4. 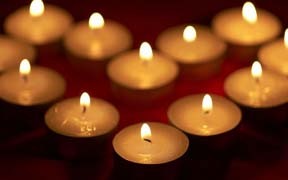 Candles are calming. As great as candles are to give, they’re even better to receive. They can help shave off the stress of a rough day and bring you back down to earth. 5. Scent of memories. The sense of smell is linked the most closely with the memory. That’s why the scent of cookies baking in the oven might make you remember your grandma when you were little. Candles are a great way to connect or reconnect with memories of the past or to help build new ones. 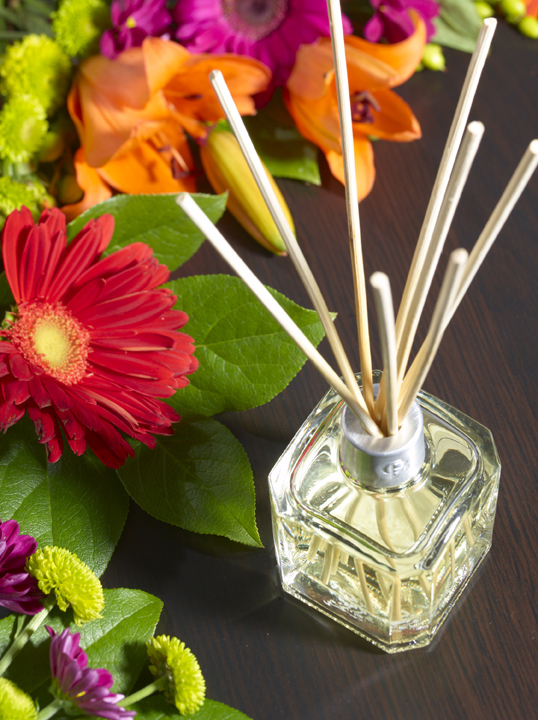 There are a countless number of ways to fragrance a room. 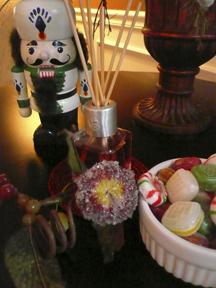 Claire Burke has covered everything from flame-released fragrance to flame free fragrance and potpourri. My personal favorite way to fragrance is electric. I love my Electric Fragrance Warmer and Refill Oil because it’s always on so no matter what, I walk into a room that already smells amazing. It gently warms the fragrance oil to disperse it throughout the room and the fragrance stays strong for up to 60 days. Its customized fragrance control even allows me to determine how much fragrance to use. Level I disperses fragrance for 45-60 days and is perfect for smaller rooms or subtler fragrance. Level II kicks the fragrance up a notch and lasts 30-45 days. This is great for larger rooms or a more intense fragrance impact. This is really handy for those moments when you need that added boost, like when you want to cover up the smell of burned food in the oven, pet accidents, or other unsavory odors that creep their way into our homes. As for me? I like my fragrance strong and keep mine on the Level II all the time. I just love walking into a bedroom perfumed with one of my favorite scents. 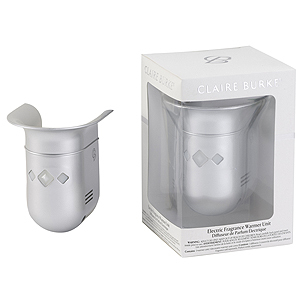 Plus, the soft glow that radiates from the signature Claire Burke diamond gives a dark room a gentle illumination, which also contributes to the calming aspect of my Electric Fragrance Warmer. Want to know a fun trick to try with your Electric Fragrance Warmer? 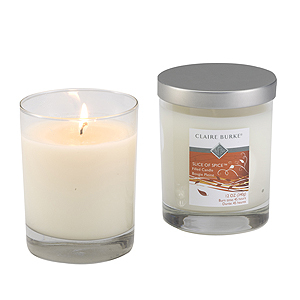 Try combining the fragrance from your warmer with a complementary fragrance from a candle! Right now, with the Thanksgiving season quickly approaching, I’ve got Slice of Spice in my Electric Fragrance Warmer. If I want to change it up, I’ll burn my Vanilla Bean filled candle to give it a sweet, fresh-out-of-the-oven scent. The combinations are endless, come up with some of your own!